Whether it's a Republican or a Democrat in the Oval Office, the energy boom that's occurred in this country over the last few years is unlikely to subside. Despite the vicious political attacks over energy policy in the United States, the recent boom in oil and gas production will likely continue, no matter who wins the White House. On Thursday Mitt Romney pledged to make North America energy independent by 2020. That goal was unthinkable a decade ago. But a lot has changed in the last few years, largely thanks to higher oil prices. The technology to extract oil and gas from shale rock was commercialized. Drilling expertise in ultra-deep water vastly improved. Canada's oil sands are now economical. As a result, oil production has jumped 14% and natural gas production 10% in the last three years alone, according to the Energy Information Administration. These are trends that neither Republicans nor Democrats will reverse. "Energy policy isn't usually a very good topic for campaigns because, for the most part, voters of all stripes want their energy to be reliable, cheap and safe," Kevin Book, head of research at ClearView Energy Partners, wrote in a note Thursday. "Neither party has much political leverage to gain from proposals that run counter to voter preferences." This isn't to say the candidates don't have their differences. Obama tightened regulation around hydraulic fracturing -- or fracking -- and offshore drilling, and would likely continue to do so. 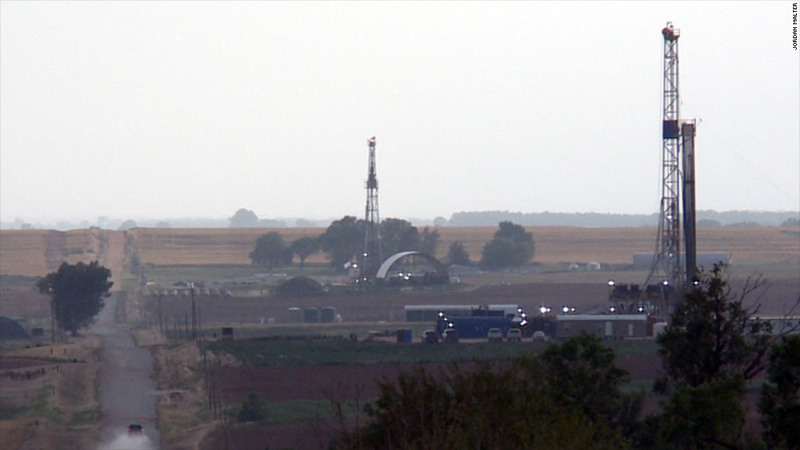 Fracking involves cracking the rock with pressurized water, sand and chemicals. Critics fear it is contaminating the ground water. Deep-water drilling comes with it's own ecological dangers. Romney would hand much of that regulation over the the states, which in many cases means lighter oversight. Romney correctly notes that the boom in shale oil and gas production has happened on private lands. His proposal for states to control drilling on federal land within their borders is an attempt to increase the boom. But most shale deposits are found in states where the land is mostly privately owned, according to a map published by the Energy Information Administration. Romney would open waters off the East and West Coast for drilling, Obama is only studying the idea. Obama has lavished money on wind and solar, and supports continued tax credits for that industry. Romney would scale that back, supporting renewables at the research level only. But most of this is going to make little difference when it comes to U.S. energy production in the short term. Even in the long term, it's only the renewables component that could be significantly altered. Obama's fracking rules have not significantly boosted costs for the industry. His support for renewables hasn't led those sources to play a big role in the country's energy mix. Romney has hammered Obama for not approving the Keystone pipeline, slated to carry oil from Canada's oil sands region to the Gulf Coast. But most analysts think the president is pandering to his environmental base, and will OK the project if he wins a second term. Romney's drill everywhere approach is also unlikely to yield a huge new bounty. Seventy percent of the nation's oil and gas resources are already available for drilling, according to recent report from the Congressional Budget Office. Regulation of greenhouse gases from the Environmental Protection Agency -- one of the main headwinds facing the coal industry -- is court ordered. Neither Obama nor Romney can change that without Congress changing the Clean Air Act -- a dim prospect. For all the talk around energy by the candidates, voters seeking a debate on policies that will significantly alter the status-quo may want to look elsewhere.